Rachel Amphlett has lived and is moving back to my favorite place on the planet—England. It’s also the place in which her Kay Hunter Detective Series is set. 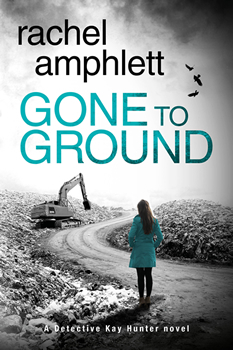 Amphlett’s latest in the series, GONE TO GROUND, continues the adventures of a dynamic main character who lives a balanced domestic, yet dangerous life. It was my pleasure to interview Amphlett for The Big Thrill. Please tell us what your new book, GONE TO GROUND—#6 in the Kay Hunter Detective Series—is about. While attending a crime scene on the outskirts of Maidstone, DI Kay Hunter makes a shocking discovery – a victim that has been brutally cut to pieces, his identity unknown. When more body parts start turning up in the Kentish countryside, Kay realizes the disturbing truth—a serial killer is at large and must be stopped at all costs. With no motive for the murders and a killer who has gone undetected until now, Kay and her team of detectives must work fast to calm a terrified local population and a scornful media. But when a third victim is found, her investigation grows even more complicated. Although the sixth book in the Kay Hunter series, GONE TO GROUND can be read as a standalone novel. Did you choose the (usually) calm and beautiful county of Kent in England for the setting, or did it “choose” you? Prior to emigrating to Australia where I’ve lived for the past 13 years, I lived on the outskirts of Maidstone in a suburb called Weavering. It was a natural choice of setting for the Kay Hunter Detective Series as I was so familiar with the locations and still have friends and family in the area who can assist with fact checking. There are a number of places around Maidstone that lend themselves to plot ideas, too—with 350 miles of coastline, beautiful countryside, and a wealth of fascinating history, I’ll never be short of story ideas. You have also written standalone novels. What are the benefits and challenges of doing both? The standalones have been fun to write, and I’m sure I’ll produce more over time, but the series is what I’m most enjoying because I have so much fun with the characters, and I love to see how they grow on me and my readers. There’s always something new to explore. It’s really the story that dictates whether it belongs in a series or not—the ideas for the standalones Mistake Creek and Before Nightfall didn’t fit with my existing Dan Taylor series of spy novels, for example, but I had to write them—the stories wouldn’t leave me alone until I had. Writing the standalone Look Closer gave me the confidence to write the Kay Hunter Detective Series as it was the first time I’d involved a character who was in the police force. That story is still a firm favorite of mine. Kay, your protagonist, is “a detective with a hidden past and an uncertain future.” Great tagline and concept. Can you share why you wanted her to be somewhat mysterious? Unlike some detective stories, Kay Hunter isn’t a lone wolf. Her team is as important, and I love the camaraderie between them. However, when we first meet Kay in the opening title, Scared to Death, she’s only just returned to work after a Professional Standards complaint was dropped against her. She then undertakes to find out why she was accused, and who set her up. Despite all this, Kay has a balanced home life. I wanted her to be different again from a lot of fictional detectives out there, so she isn’t lonely or anything like that. Rather, her other half Adam is a vet. This also gives me a chance to have some fun with readers when he brings home various animals to look after. It provides some light in contrast to the dark crimes Kay investigates throughout the series. Your background includes working as a TV and film extra and a freelance producer for the BBC. As different as those experiences seem from writing, how have those careers helped you with writing books? I think it all comes down to storytelling. I’ve always been surrounded by it, and having studied screenwriting here in Australia, it’s something I apply to my novels. The structure afforded by screenwriting certainly helps with plotting and understanding story beats to keep readers turning the pages. I’ve often wondered how such devices as a sit/stand desk and dictation software works for a busy writer. What can you share about using these? Honestly, both have been lifesavers. I started using Dragon Dictate about two years ago – it takes some getting used to, but practice is key. I now write 90% of every first draft using the software. I invested in the sit/stand desk earlier this year. I’d had an on-desk system before, but it hurt my back leaning over and raising it manually, so the electronic one was a must-have. Now, I can walk back and forth with my noise-cancelling headphones on while I dictate, and I can vary the height to a sitting position if I want to work on advertising, for example. I can’t imagine working without either of these tools now. Every published author faces the demands of writing time/social networking vs. the demands of “real life.” Can you share any advice on how you discipline yourself and use your time? When I became a full-time author last year, this was so important to me. I’d heard nightmare stories about others who had left work to do this, but quickly lost the discipline of writing every day. When I used to work in a “proper” job, I commuted by train to work so I’d jump on at about 7 a.m., then get my head down and write for 30 minutes before getting to work. That meant I kept on top of my minimum word count every day. When I became a full-time writer, I kept that habit. I sit down at my desk at 7 a.m. every day and write. None of the other business and marketing stuff gets a look until the words are done. It’s as simple as that. 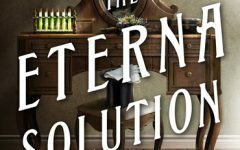 She’s a member of International Thriller Writers and the Crime Writers Association, with the Italian foreign rights for her debut novel, White Gold, sold to Fanucci Editore’s TIMECrime imprint, and the first four books in the Dan Taylor espionage series contracted to Germany’s Luzifer Verlag. 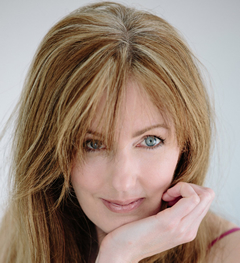 You can stay in touch with Rachel via her Reader’s Group or drop her a line via her website.